Act now – making change, don’t just talk about it! Students of the IE University BBA program will have to get involved into a Social Impact project during their studies. See some of the examples of their initiatives and feel the impact they created. In the summer of 2011, sixteen MBA students from IE Business School travelled to South Africa to take part in a 7 week life-changing experience. As fellows of the Leadership Development Program of the Emzingo group they worked on consulting projects for local NGOs. Is money a myth? Where does it come from? Jem Bendell, visiting professor at IE Business School recently participated in TEDx Transmedia and talked about the money myth. Interesting thoughts… a little frightening though. IE Business School holds the No. 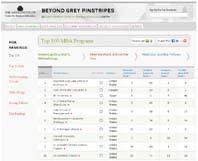 3 position worldwide in Aspen Institute’s Beyond Grey Pinstripes ranking. The biennial survey is the most important in its field, gauging the level of integration of social, ethical and environmental issues in the MBA and executive education programs of 149 business schools. In this latest edition, IE Business School has climbed from 9th to 3rd place, thereby further consolidating its position as a leading reference worldwide in the integration of corporate social responsibility into management education programs. The Beyond Grey Pinstripes report examines the extent of each school´s inclusion of issues related to social responsibility, ethics, and the environment in MBA programs, aimed at shaping managers and directors with a sound awareness of how their business decisions impact the environment. The ranking is based on a total of over 80,000 pages of information provided by 149 business schools from 22 countries. Parameters include social, ethical and environmental content in MBA programs, and the level of student exposure to related issues. In this year’s edition, the MBAs of business schools include an average of 33 courses that feature content related to sustainability, while the IE Business School MBA includes over 90. The report also evaluates the opportunities schools provide for their students to devote time to ethical and environmental concerns, along with the number of teaching hours dedicated to such issues, the percentage of students who choose to get involved, and the relevance of MBA course content and research carried out by faculty. Learn in the lastest edition of IE Edutainment about first year IE University BBA student Carolin who spent 2 months at UNICEF – part of IE University’s Social Impact Project – and we go behind the scenes at the First International BIARI Workshop, as participants wrestle with the issue of Climate Policy for World Cities.